I’m going to be joining fellow Wyvern poets for a Franken-poetical event on Wednesday November 21st at 17.30 in The Global Room at Dundee University. 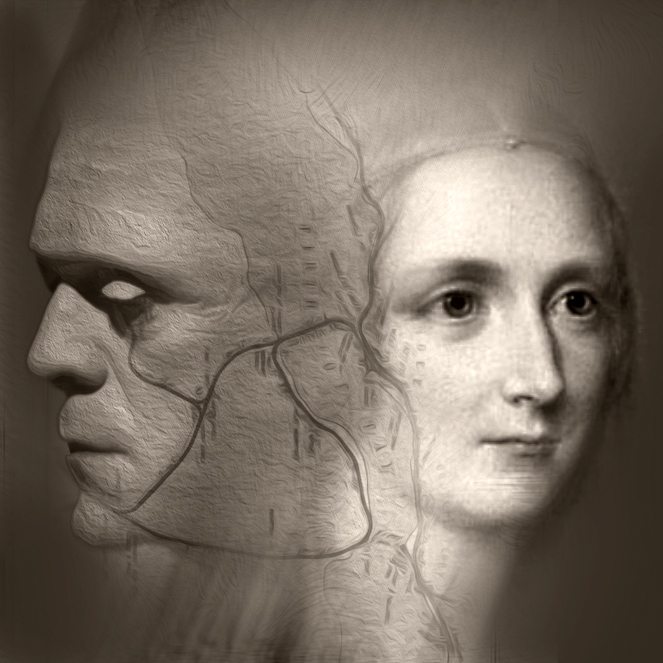 As part of this year’s Being Human festival, we are celebrating the 200th anniversary year of the publication of Frankenstein with readings of new poems ruminating on Frankenstein, technology and identity, and Mary Shelly’s own early association with Dundee. Tickets are available free from eventbrite. Darren McFarlane’s painting of D’Arcy subject to one of his own mathematical transformations! This exhibition brings together 18 artists, makers, poets and designers whose work is intimately connected with trees and woodland. Though their works span a wide variety of media they are all united by a strong affinity with woodland; as a place to observe and connect with nature, as a rich source of metaphor, as a place for reflection and healing, as a link to distant myths and inspiration for new writing, as a sustainable resource to work with. For some, trees are their singular subject or their raw materials, for others they represent a starting point for their imagination. 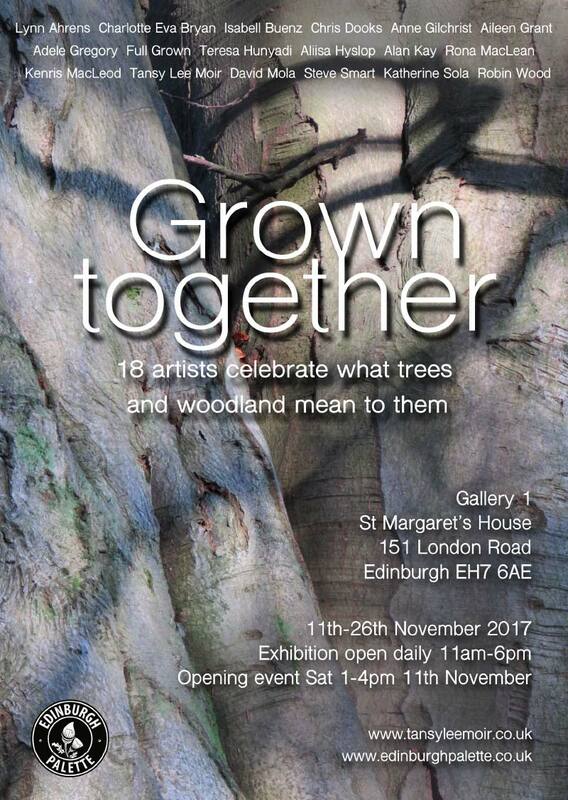 Timed to coincide with the launch of the new national Tree Charter, ‘Grown together’ seeks to highlight the relationship between artists and trees and remind us of the reasons we should value and protect them. By considering trees in new ways, we can learn much about ourselves. Exhibition opening event 1-4pm Saturday 11th November. Exhibition open daily 11am – 6pm until Sunday 26th November. Events during the exhibition run – to be confirmed. I love the idea of landscape as layers upon layers of fragmented story, like an old hoarding in town where torn and muddled fragments of years of past paint and posters are visible if you have the time to look and pick a bit. Stanza’s Poetry Map of Scotland – a map with a meta layer of poetry – appeals on many levels. This post is about an event next week where some contributors to the map (including yours truly) will be reading contributions as part of Book Week Scotland. There’s also an open mic for ‘readings from the map’ so you can join in too if you like (see below for details). For Book Week Scotland in 2016, StAnza will turn its hugely popular project to map Scotland with poetry into a live event, taking place at Zest Coffee Shop in St Andrews on Thursday 24th November. More than 200 poems have been submitted since the project was launched in 2014. We have invited a selection of poets whose poems feature on the map to lead us on a poetic journey around Scotland, and Zest will make sure that we don’t lack food and drink for the trip. Those taking part include Gordon Jarvie, Sue Haigh, Steve Smart, John Brewster and Lyn Moir. We’ll also have some open mic slots if anyone else would like to read their own poem from the map, or perhaps a poem from the map about a favourite place. You can browse the map online and if you’d like to ask for a reading slot, just email stanza@stanzapoetry.org. The event is free and unticketed but if you’d like to be sure of getting a seat, email stanza@stanzapoetry.org for that as well. Meantime here are those details again, and we hope to see you there: Thursday 24 November 2016 18:30 – 20:00 at Zest Coffee Shop, 95 South Street, St Andrews, Fife KY16 9QW.